Thanksgiving has become my favorite American holiday. Though when I first arrived to the US, more than 20 years ago to Texas, I had never heard of the celebration. I was a bit perplexed as to why people where roasting turkeys so early in the year (in Mexico turkey is a Christmas tradition). Now, I totally get it. I love how everything seems to stop and be put on hold. I love how attention shifts almost entirely to food and the kitchen takes center stage. I love the intense emotions that surround the holiday. I love the time of year. And, since Alan left for college, I love that our family will all be together for a few days, mostly eating. I especially love how Thanksgiving opens the door to celebrate the contributions that immigrants have historically brought to the American table. Now, more than ever, this is deeply meaningful to me. I love how Thanksgiving embraces and holds onto to classic recipes and traditions that have been passed down through generations. But I also love how it welcomes new and surprising additions that complement the rest. In that spirit, I created a Dulce de Leche Caramel Cinnamon Chocolate Pecan Pie. I had never tasted pecan pie before moving to the US. And then about a decade ago, my dear friend Debra introduced us to her dark chocolate version of pecan pie… which we devoured so fast that she started bringing, not one, but two each year. Last year, I told her I was tempted to make it a bit more outrageous and decadent by incorporating Dulce de Leche Caramel to that super gooey filling. Dulce de leche caramel, or Mexican cajeta, is an iconic ingredient in Mexican kitchens. We Mexicans are crazy about it. Made from goats’ milk, rather than cows’ milk, as in some other countries, it is also made in a traditional way – cooked down slowly as layers of flavor build into each other in a single product. It’s so good you can eat it with a spoon, or top your bananas or apples with it. In this recipe, dulce de leche caramel makes for a more gooey, more sticky, more chewy filling with a rich, deep and intrinsic rustic caramel taste. I went for Coronado’s dulce de leche caramel cinnamon variety to give it a hint of the sweet spice so familiar in holiday recipes. The pecans have a better cushion to sit on and be coated in. The chocolate chunks can shine even more. Place the flour, salt, sugar and diced cold butter in a food processor. Process a few times, until the mixture looks like a coarse meal. Add the cold water and process again a few times. The dough should become more moist. Turn out of the food processor and gather into a ball. Lightly dust your countertop with flour, and knead the dough 3 to 4 times until it comes together. Shape into a flat ball, wrap in plastic wrap and refrigerate for until firm, about an hour. In a bowl, beat the eggs with a whisk until foamy. Incorporate the Coronado® Dulce de Leche Caramel Cinnamon, brown sugar, corn syrup, melted butter and salt and whisk until it is well blended. Add the chopped pecans and chocolate and mix well. Set an oven rack in the middle of the oven and preheat to 375 degrees Fahrenheit. Remove the dough from the refrigerator. Lightly dust your countertop, hands and a rolling pin with flour. Roll out the dough into about an 11” to 12” round. Place it in a pie mold, pressing the bottom and sides into the mold and crimp the edge on top. My whole family watches And loves your show! I say this because my son is 20 and daughter 18 and are always flying off somewhere but you stop them from even looking at their phones. Only bad part is they them turn to me and ask for me to make all your recipies. I made the mistake of making three and now that’s all they want! Anyway, thank you for showing the US the beauty that is Mexico, it’s people, culture and cuisine! Love you and keep cooking and showing us Mexico! Love your comment, Margarita! Say hi to your son and daughter for me! I’m so glad you are trying some new Mexican recipes, Mary Jean…hope your boys love them! Esta receta es del otro mundo – ¡no hay mejor! ¡Gracias, Pati! Hi Pati – love you show. 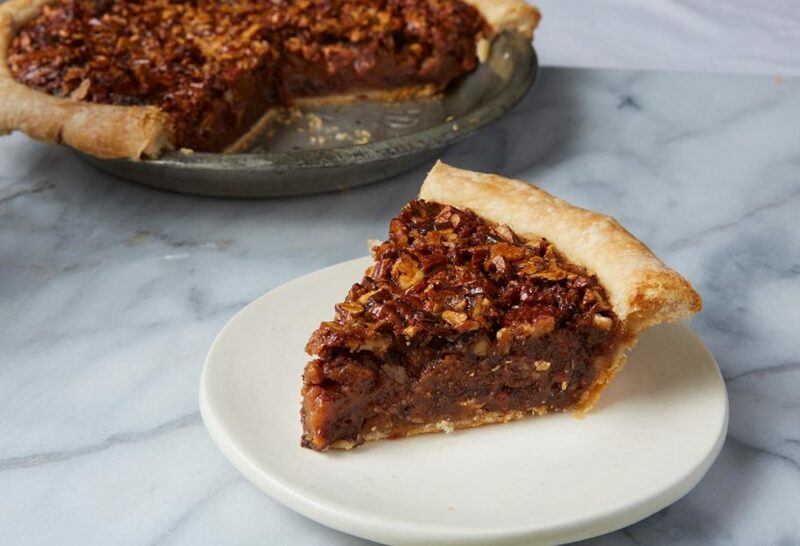 Can the pecan chocolate pie be cooked the day before and refrigerated? Then brought to room temp to serve the next day? For sure, Celia! You can make it ahead and keep it in the fridge. Then bring it to room temp on the counter before serving. Here they are, Jeri: https://patijinich.com/recipe/shrimp-enchiladas-in-a-rich-tomato-sauce/ https://patijinich.com/recipe/dulce-de-leche-caramel-mousse/ https://patijinich.com/recipe/chocolate-salami/ Enjoy! Making your pie, but in the video you say 1/4 cup of corn syrup and brown sugar and in the written recipe it says 1/2 cup which is correct? I sometimes tweak the recipes to make them perfect after filming, Peggy. The written recipe is correct, use 1/2 cup. Hi Pati, Thank you for sharing this delicious chocolate pecan pie recipe. This has become one of my favorite pies! I really enjoyed your video too. My pie crusts in the past we’re always questionable but I liked your advise to mush the dough as a test to see if enough water has been added. Now my pie crusts are super flaky and so yummy! I love your enthusiasm for for cooking. It’s so inspiring. Beyond happy to hear that you were inspired…and have flaky crusts now, Jolene! The pie was FANTASTIC! I’ll never go back to the traditional recipe. SOOO happy to hear this, Linda! Pati, my dad asked me to make a pecan pie for Thanksgiving and I decided to make yours. It was the most delicious pecan pie I have ever had! So luscious and velvety in texture. I am usually not a fan of pecan pie, but this one was a keeper! Thank you! Thank you for sharing this recipe, Pati! I love your show a lot! You’re a wonderful cook and Mom!! Happy Thanksgiving! Aww gracias, Gail! Happy Thanksgiving to you too. I have all my stuff laid out to make this after work today; I can hardly wait! Thank-you, Pati, and God bless you and your family! Yay! Have fun making the pie after work, Theresa. You bake it until the filling is set, Arutuo. Depending on your oven it should take about 55 minutes. Hi Jan, if you can’t find it in the Hispanic aisle of your local retailer, you can add cinnamon to any dulce de leche that you can find. Have fun making the pie! I found the Coronado dulce de leche caramel at my local H.E.B. In Kerrville,TX, but not the cinnamon flavor. Can you tell me how much cinnamon I should add? Can’t wait to try your recipe Pati! Thank you! I really enjoy your show!! Oh you can add cinnamon to taste, Betsy. Start with a little and go from there. I’m going to make this as my contribution to our annual gathering with friends. I’m inspired and motivated by your genuine love of food and this day of sharing. Thank you, Pati! I hope you have a great dinner with all of your friends, Tamara. Thank you for sharing this wonderful recipe! Love your cooking and your show! I just pull the pie out of the oven! Se ve delicioso!! Un aroma!! But I cheated (I’m sorry) because I couldn’t find that brand of dulce de leche so I have to use the one I had already ina. Can. On your video it appears that your recommended brand is more loose and not thick like the can of La lechera Dulce de leche, so I measured exactly one cup but the eggs I got were big so overall my filling looked very close to yours on the video (ohh I added cinnamon powder to the mix since I couldn’t get the brand suggested). I follow your recipe (al pie de la letra) step by step, which I almost never do since I like to add my own twist, just because I am more comfortable with entrees and not much experience with pies; I was really nervous. BUT 55 minutes later it was not even close to be done and the crust was getting dark. I wonder what did I do wrong? My stove is a gas stove and the oven temp was at 375’F, though it felt higher. So I lower the temperature, turned the oven light off, and waited… 20 mins later was finally done. IWOILD LOVE TO HEAR WHAT DO YOU THINK it went wrong. …now I’m waiting to cool down to taste it!!! No puedo esperar!!!!!!!!! Hmmm it was probably the oven temperature, Astrid. All ovens are different, so it might have just needed that extra 20 minutes. I hope you loved the pie! Love the concept of dukce fe leche AND chocolate in me favorite pie. Can’t wait to make this next week. Is the recipe for a regular or deep pie dish. Oh I just used a regular 11” to 12” round pie dish, Carole. Have a yum Thanksgiving! Thank you Pati! We usually have pecan pie for Thanksgiving, but were looking for something new and a little different and this will be it. Can’t wait to try it. I love your show and never miss it. I think you and your family are wonderful. Yay! Have a wonderful Thanksgiving, Debbie! Yay! Enjoy your new Thanksgiving tradition, Sahar. You can find Dulce de Leche in your supermarket in the international or Hispanic food aisle…or online. And here’s my cheesecake recipe, Christina: https://patijinich.com/recipe/dulce-de-leche-cheesecake/ Some of the pecans should rise, so that’s why you don’t have to put them on top. Have fun making the pie! Because this pie looks amazing, my mouth is watering, I can hardly wait to make it. There will be a test run before the holidays. Thanks for this recipe. Thanks for your show as well. It is always informative, you make recipes look easy & accessible, and you are fun to watch. It’s always such a bright spot for me. P.S. for those having trouble finding this product/brand, try Walmart. Only place I’ve found it in Wyoming. Aww thank you so much Lori! Have a Happy Thanksgiving…and a super yum test run. Of course, Flower! Cook it the same way…until the filling is set. Yum! One of my all time favorite pies with a twist. Just want to clarify one thing. In the video you say 1/4 cup of corn syrup and 1/4 cup brown sugar, but the written recipe instructions say 1/2 cup of each. Which one is it? I’m really excited to try this and thank you for creating!! Oh I sometimes tweak the recipes after filming the show to make them perfect. Enjoy the pecan pie with a twist, Rikki! Thanks so much for all you share with everybody Pati! I am a fan of your shows on PBS and just love every recipe you share. Wish you and your lovely family a Happy Thanksgiving!! Thank you Matilde….and Happy Thanksgiving! If using just the regular Dulche de Leche could I add the cinnamon directly to the filling? How much would ypu recommend? You can if you can’t find the Dulce de Leche Caramel Cinnamon. You can add about 1/2 tsp or cinnamon to taste, Cindy. Enjoy! What is Dulce de Leche Caramel Cinnamon? Where can I buy it in New England? Oh its a new flavor from Coronado…try the international/hispanic food aisle at your local market. If you can’t find it, you can add cinnamon directly to the filling. This sounds so-o good. I can’t wait to try it! What could be better…carmel, chocolate…and pecans! Wow! It’s a pretty yum combination…enjoy, Betty! Pati, I absolutely have to try this pie. I ran all over town today and looked for the Coronado Dulce de Leche Caramel Cinnamon and couldn’t find it. I even looked on Amazon and see a regular Dulce de Leche but nothing mentions cinnamon. Do you know where I can find it ? Thank you for sharing such delicious recipes. Oh I’m sorry you are having trouble finding it. If you can’t find it at your local store, you can add cinnamon to taste to the filling. Enjoy the pie and many more recipes, Lynn! I’d love to try this recipe! Could you give me any ideas where I might find the Coronado Dulce de Leche Caramel Cinnamon? I will have to see if I can find a local market that has a good selection of Hispanic products. I don’t see it on Amazon (they have the plain type, but not the cinnamon). Give the International/Hispanic aisle of your local supermarket or major retailer near you a try, Sue. If you can’t find it, you can add cinnamon to taste to the filling. Have fun making the recipe. Please tell me where I can buy the Coronado dulce de Leche Caramel Cinnamon. I live in NYC. Or can I use another brand and add cinnamon? Even Amazon does not have it. If you can’t find the Coronado Dulce de Leche Caramel Cinnamon, you can add cinnamon to taste to the recipe, Jill. Hope you love the pie! Hi Patti! I am looking forward to making this pie, but I am new to Mexican ingredients and haven’t been able to find the Coronado Dulce de Leche Caramel Cinnamon. Is it their regular flavor? I only saw three types listed on their website and none of them were specifically cinnamon. Thanks for any help you can provide! It’s a new flavor by Coronado! You should be able to find it in the International or Hispanic aisle at major retailers. If you can’t find it, you can add cinnamon to taste to the recipe. Oooooh! I have to try this…..well because I have too. Yay! I hope you love the pie, Berrim. Was asked if I’d do a pecan pie for Thanksgiving and was giving it some thought…then I happened to see your recipe and looks like a winner. Thanks! Oh what good timing, Joel. I usually make bourbon chocolate pecan pies for Thanksgiving and Christmas. This year it will be yours! This will definitely be on our dessert table this year! A dessert table! Sounds like a super yum feast, Denise. I think this will be our Thanksgiving pie this year! It’s similar to Derby pie — one of our favorites, so I might add a bit of mezcal to spice it up a bit. Gracias! Oh I just had Derby pie for the first time when I was in Kentucky a few weeks ago…so good too, Mark. Pati. First let me just say that you inspire me to cook. I mean cook anything! I love everything about your show and what it represents. Thank you for what you do. Second, I love pecan pie AND all things “fall spice” so I can’t wait to try this! Keep doing the fun things you do so I can keep learning. Oh thank you so much, Jacquelene! Wow!!!! Nunca se me hubiera ocurrido usar Cajeta para esta receta. Un toque mexicano muy mexicano. Gracias por compartir tus recetas. Happy Thanksgiving wishes to all! Love the recipe, love the program. Always bright & sunny, a touch of warm beauty. Thank You for sharing this wonderful culture with us. Thank you so much Susan! Happy Thanksgiving too. Happy Thanksgiving and Blessing tho you and your family. Thank you for your shows and newsletters. Can I make this a day or two ahead of time before Thanksgiving? Show I refrigerate it? Show I warm it too room temperature or microwave or oven to serve? Happy Thanksgiving to you Kathy! You can make it ahead and keep it in the fridge. Then bring it to room temp on the counter before serving. Can not wait to try this. I love Pecan pie, but with chocolate, it sounds great. We are a family of chocolate lovers…so I had to add some to this recipe. Enjoy Pauline! I enjoy your TV show so much. My husband watches it with me. You are so happy and the dishes you use are so colorful and fun. Your personality and love of the food comes across like I am on the trips and there with you tasting. Thank you. Aww thank you so much Sherry! 2) Eye surgery less than a month ago: how can I copy paste to my AOL account. Apparetnly I cannot copy your recipe but print it…POINT: I need to enlarge the font for eyes and BOLD the print. Can you help? Thank you for any idea! Happy Holiday Patti and thank you for the Dulce de Leche Caramel Cinnamon Chocolate Pecan Pie recipe. Look for Coronado Dulce de Leche Caramel Cinnamon at any of your major retailers in the International of Hispanic food aisle. If you can’t find a bottle, you can add cinnamon to taste to the filling. And I hope you are feeling much better after your surgery, Patricia. Usually on your printer, you can make the font bigger by zooming in…look for that in your printer settings. Enjoy all of the recipes! Happy Thanksgiving to you too Nilda! I don’t know where to find Coronado® Dulce de Leche Caramel Cinnamon around my home, but you can bet regular dulce de leche will make it into my pecan pie this year. 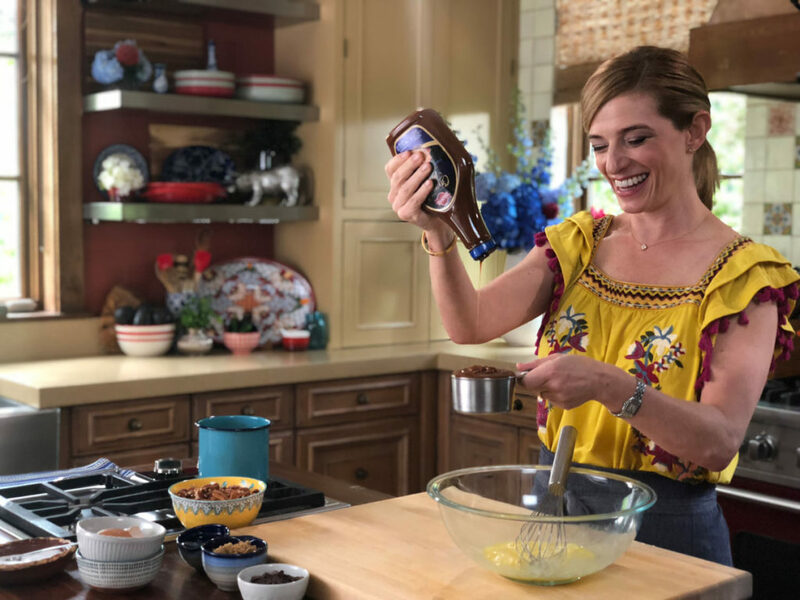 Oh you can usually find it in the Hispanic aisle of major retailers…but I’m happy to hear you will be adding some dulce de leche to your pie this year, Anne! Coronado Dulce de Leche Caramel Cinnamon is not available anywhere–not at Coronado Company site, not Amazon or eBay or the Mexican markets near me. Any suggestions for substitutes to replicate the same taste? I’d really like to try this recipe. If you can’t find it, you can add cinnamon to the dulce de leche caramel that you can find. cannot find this product anywhere in my town in Fairbanks, AK. Must be a new product. It is a new product! If you can’t find it, you can add cinnamon to taste to the recipe. I cannot eat anything with corn syrup so I substituted maple syrup and also used bitter sweet chocolate chips….delicious!! I’m glad you made the recipe your own, Yolanda. I cannot find the Coronado® Dulce de Leche Caramel Cinnamon variety. I can only find the original. Where can you find the cinnamon variety. I want to make this for Thanksgiving. You can usually find it in the Hispanic aisle of major retailers, but if you can’t find it, you can add cinnamon to the dulce de leche caramel that you can find. Have a Happy Thanksgiving, Diane! Paty me encantaría que nos dieras unas resetas como preparar pavo para este próximo día de gracias. Coronado® Dulce de Leche Caramel Cinnamon What is this ingredient, where is it sold? Oh it’s a brand of dulce de leche that has cinnamon mixed in to it. You can find it in the Hispanic aisle of major retailers. nd iff you can’t find it, Patty, you can use the dulce de leche caramel that you can find and add cinnamon to taste. Would love to make this but am unable to find Coronado Dulche de Leche Caramel Cinnamon anywhere, store or internet. Can you recommend a retailer or link to a website where this can be purchased? Thank you gorgeous. Hmm you can usually find it in the Hispanic aisle of major retailers, but if you can’t find it just use the dulce de leche caramel that you can find and add cinnamon to taste. Enjoy the pie, Lily!